A Walk in the Woods doesn’t measure up to its promise or its premise. The promise: Robert Redford as producer co-starring with Nick Nolte with fine support from his serious connection to Sundance. The premise: two old guys agree to walk the Appalachian Trail in one big, probably last adventure. How can it fail? It doesn’t fail badly; it is simply quite dull on all fronts including both acting and script. The colors and the wilderness make it worth a look, but don’t expect too much. 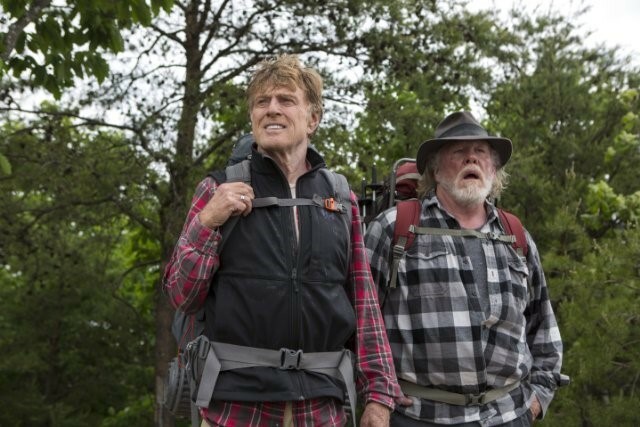 Humor writer Bill Bryson (Robert Redford) has decided to indulge his bucket list dream of doing something big. He will walk the Appalachian Trail, all 2200 miles of it from Georgia to Maine. But Bill is married to Catherine (Emma Thompson) who knows only too well that at his age he mustn’t do it alone. After turndowns from friends, a call comes from Stephen Katz (Nick Nolte), a classmate from years ago whose friendship ended in a flameout long ago. When Katz arrives, stumbling and muttering from a long bus ride, we smile in anticipation of the conversational banter that will be coming our way. Credit Kristen Schaal with creating a funny nutcase who glues herself to the hikers while spewing forth an endless stream of nonsensical comments. The sight and sound of the three of them is good comic fun and after they manage to dump her, we think fondly of what will happen when she returns. It never happens. It’s no fun to take pokes at a man like Redford who has worked consistently to contribute to the film world through the superb work that comes from his Sundance film festival. That said, there is just no humor or fire in his performance as he walks through dull lines like a wooden puppet. Nick Nolte’s mumbling is often hard to understand and the thought of his walking even a mile is ridiculous. Because neither character is interesting, the rich old age duet that good writing might have created never happens. Unfortunately, the whole thing is forced and cute – two adjectives filmmakers try to avoid at all costs. Only Emma Thompson, warm and worried about her man, conveys the warmth we want to see. If either man had chosen her as a hiking partner, maybe the movie would have worked. There are no surprises here and the talk is like lukewarm soup. This is actor/producer Redford in need of a script. This review was posted on September 7, 2015, in Action/Adventure, Comedy, Drama. Bookmark the permalink.